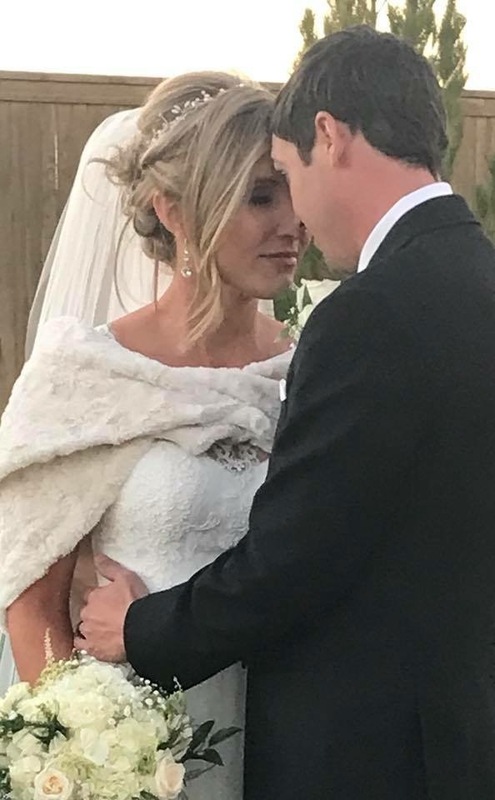 I didn’t have the privilege of attending Brittany and Adam’s wedding at Autumn Oaks Event Center, but after talking with Brittany I can see just how perfect these two are for each other. Brittany told me the story of how the two newlyweds met and how they fell in love. How did Brittany and Adam meet? I fell in love with Brittany’s story of how her Groom proposed to her. “In September of 2016, we took a Cruise with Brittany’s family to congratulate our cousin, Michael Maul, on Graduating from the University of North Texas. On the night of September 6th, the dining room Maitre D’ came around to our table and asked for a personalized photo with me. He said he always took several photos with guests throughout the cruise week. He took me up to the main dining room grand staircase and asked me to stand beside the baby grand piano. Immediately, I thought it was super strange that the photographer started taking pictures of only me. I thought this was a bad glamour shots photo session. I started looking around and questioned the Maitre D’ why he was not taking the photos with me. All of a sudden, I saw Adam buttoning his suit jacket and walking towards me. My first instinct was thank goodness he came to rescue me! I was literally taking photos, by myself, in the middle of a 3 story dining hall that was feeding around 700 guests. What is one of your favorite memories from your wedding day? Brittany says the wedding video is just amazing and they have so many special memories from their wedding day. She shared just a few of her favorite memories with me. 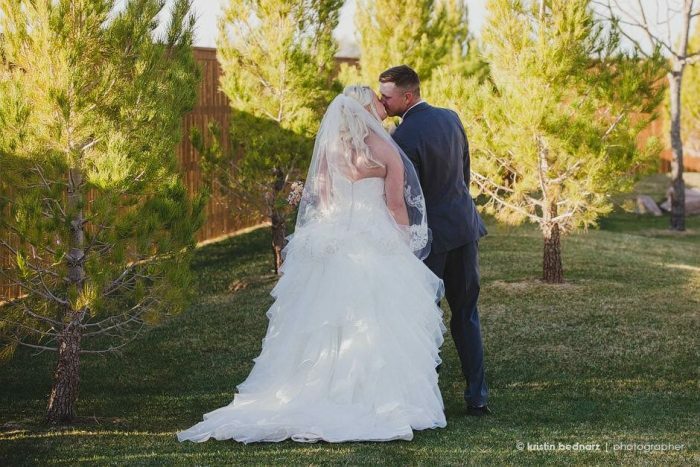 We were honored that Brittany and Adam chose Autumn Oaks to host their special day. It was a gorgeous wedding for a beautiful couple! 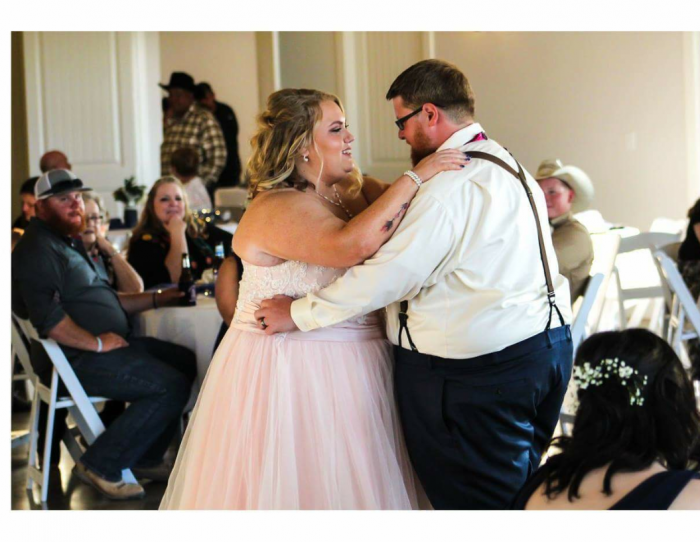 Courtney and Kristopher married March 24, 2018 at Autumn Oaks Event Center. 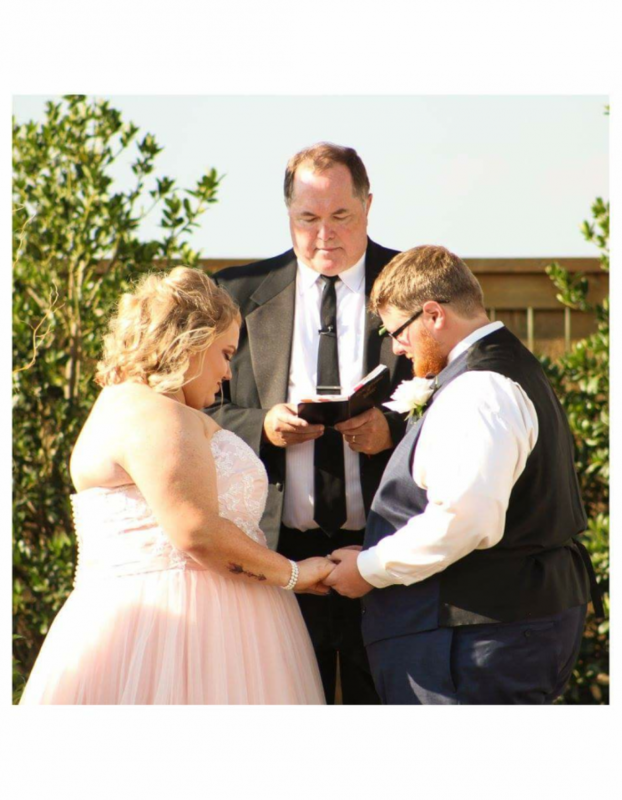 It was in intimate outdoor ceremony on a gorgeous day followed by a beautiful reception inside. Courtney is originally from Fort Worth and Kristopher is from Wolfe City. Courtney joked that “You would never guess someone who came from one of the largest and busiest cities in the U.S. would end up with a boy who came from a town with only a Dollar General and Kwik Check Gas Station!” While attending Texas Tech University, Courtney fell in love with Lubbock. Little did she know, Lubbock would one day be where she would marry the love of her life. After graduating from Texas Tech University, Courtney was offered a job in Dallas, Tx. 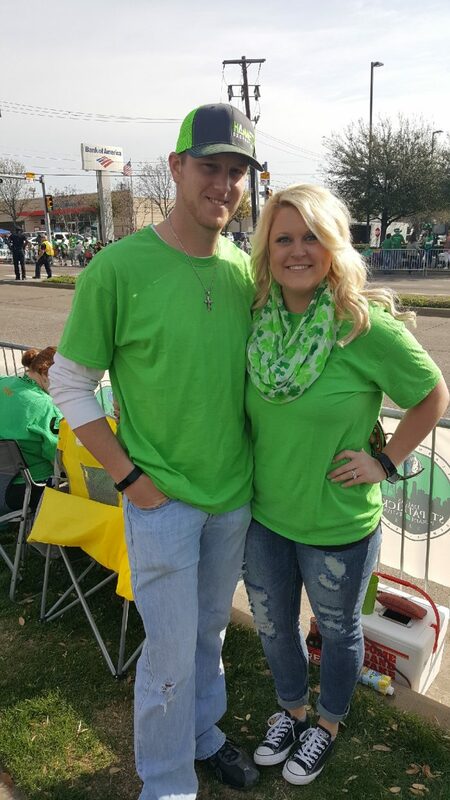 A few months later, she attended the St. Patrick’s Day parade in Dallas where she was introduced to Kristopher through a mutual friend. “The luck of the Irish brought us together” Courtney said. The couple have attended the parade every year since. 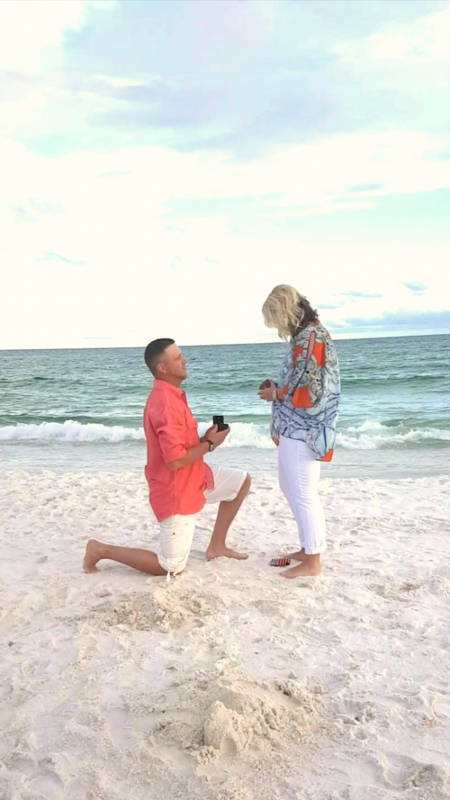 Two and a half years after meeting, Kristopher proposed to Courtney on her annual family summer vacation to Destin, Florida. Courtney had no idea what was coming! She was completely blown away when Kristopher got down on one knee and asked her to be his wife. The couple started their new life together on a honeymoon in Punta Cana relaxing on the ocean and exploring the country. 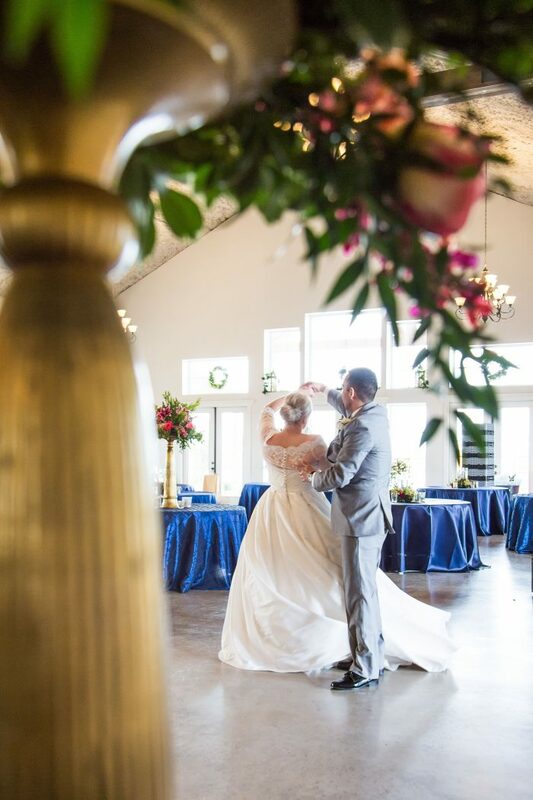 It was a pleasure hosting this sweet couple’s special day at Autumn Oaks Event Center. We wish them a lifetime of love and adventure! Nothing says winter like hot coco. 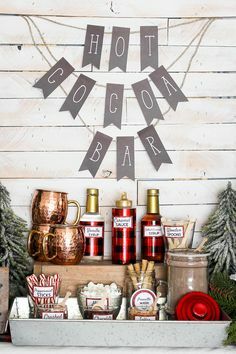 The rustic theme mixed with the copper mugs and red buffalo plaid is the perfect holiday mix! The colors in this mix are captivating and the recipe is delightful! 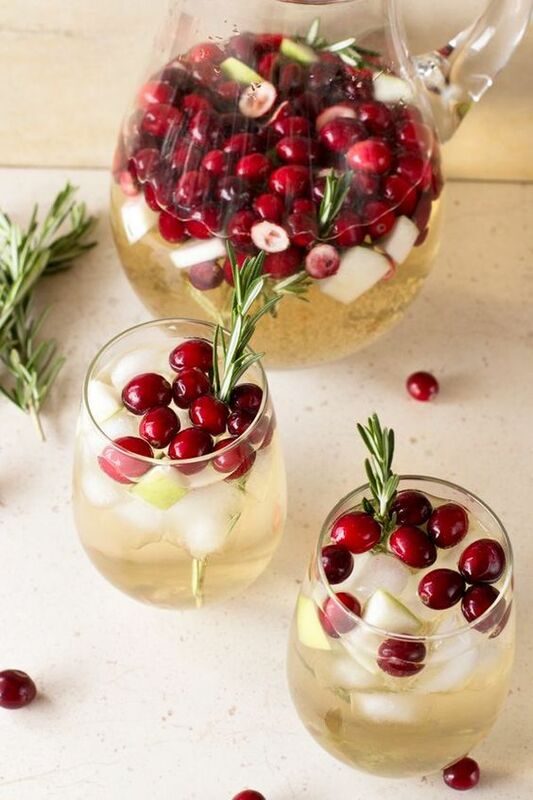 Pinot Grigio, sparkling apple cider, cranberries, and apples… Yum! 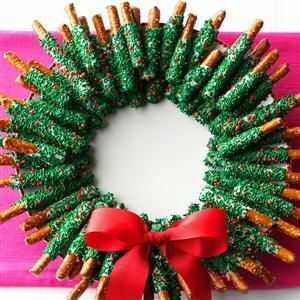 Chocolate covered pretzels… Mmmm! Love this festive display. This is the perfect snack to munch on at any gathering. 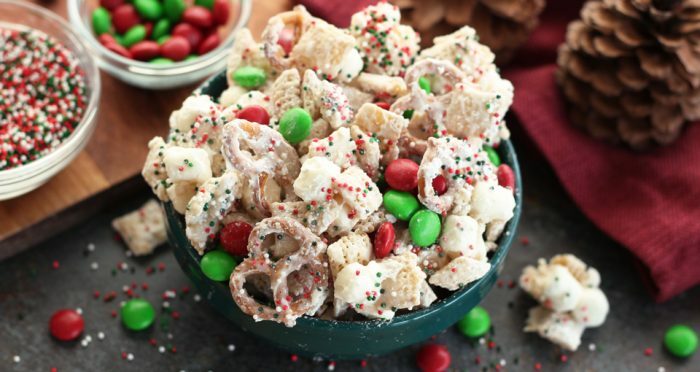 We like to call it “Reindeer Chow”. My Mother in Law makes the best Reindeer Chow! 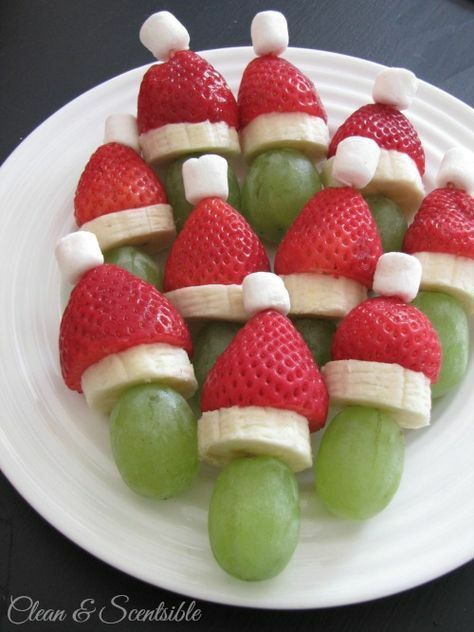 This is such a simple way to add some holiday fun. Who doesn’t love red and green m&ms anyways! You can never have too many sweets in my opinion, but it’s a good idea to have something to snack on that isn’t so sweet also. A mixture of cheeses and grapes is a great idea! A spread shaped like a Christmas Tree is even better! How simple and fun is this?! Fruit is a great addition to any party. 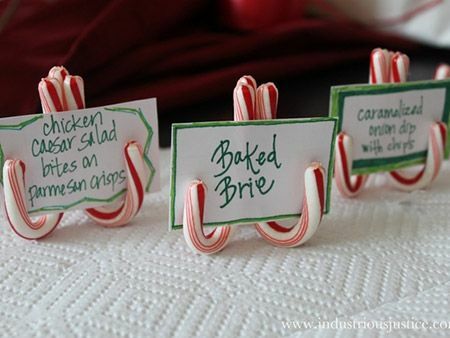 This is a great idea for place settings or a way to display the different food and drink choices. 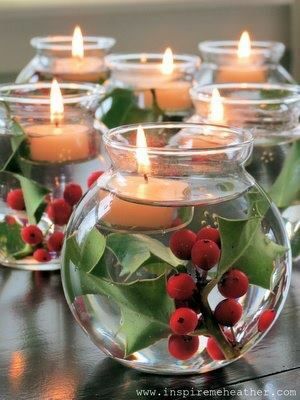 If you are adding place settings to your holiday party you need centerpieces too! This is a simple, elegant look. This would look great with the Christmas Sangria too! 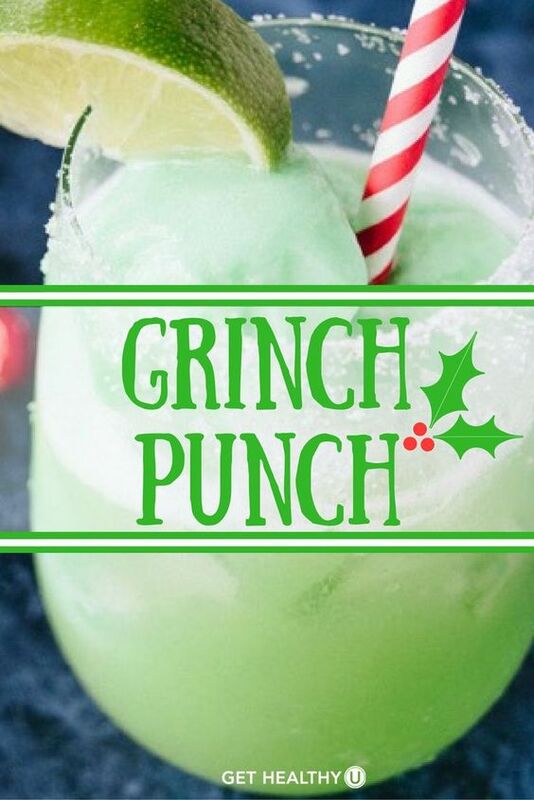 Champagne, sparkling soda, lime, and lime sherbet…. Need I say more? 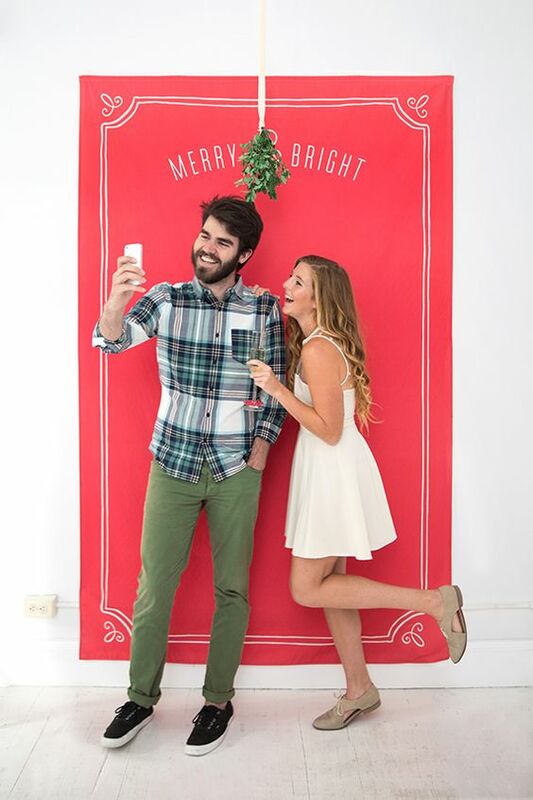 Last but not least, every great party needs a little mistletoe! 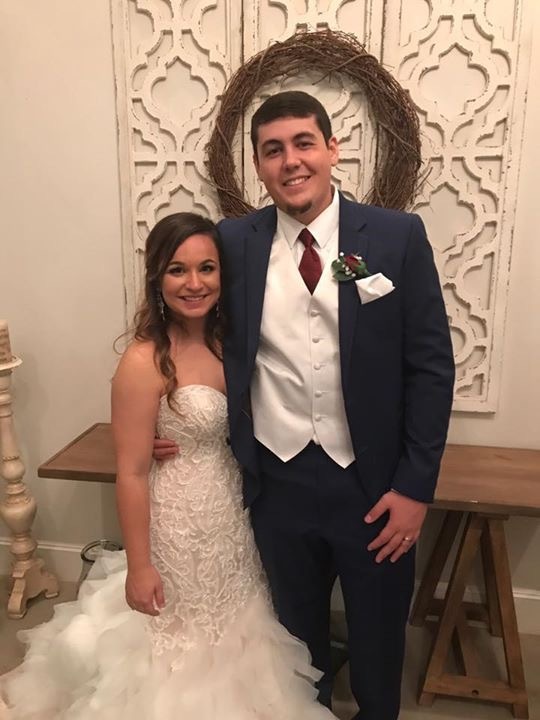 Morgan and Shawn tied the knot at Autumn Oaks Event Center in October 2017. Fall wedding season is my favorite time and theirs was absolutely perfect! It was a beautiful Autumn day for an outdoor wedding. They had an intimate outdoor ceremony followed by a gorgeous indoor reception with their loved ones. A year and a half later, Shawn popped the question! He had big plans for an engagement in Durango, Colorado while on a ski trip until plans fell through and the couple wasn’t able to go . That didn’t stop Shawn though! He planned to take Morgan out to dinner. When he arrived at there house, he rang the door bell and quickly got down on one knee and asked her to marry him. She excitedly said yes! The couple started their new life together with a honeymoon in Jamaica relaxing by the pool and beach, spending time with each other. Autumn Oaks Event Center was honored to host Morgan and Shawn’s wedding and enjoyed working with this sweet couple. It was a wonderful day. We wish them a lifetime of love and happiness! and Judy had only one grandbaby on the way. the madness, Brant (grandbaby #3) was born in August. their third and they moved to Amarillo. Now, Matt and Cortnee are expecting again. Are you guys as overwhelmed as we all are??? but it has also been such a blast. We wouldn’t want it any other way! watching the flower girls do their thing, but her very favorite part is getting to eat wedding cake! Fun times ahead for this family! I haven’t had the privilege of meeting this Bride in person but after discussing this blog with her, I can tell she is the sweetest! I asked her a few questions about her and Morgan and I am in love with their story. How did Makayla and Morgan meet? This love story began on Facebook. Morgan, from Lebanon, PA and Makayla from Portales, NM originally became friends on social media through mutual friends. Morgan graduated from Eastern New Mexico with a degree in Criminal justice and Makayla graduated from Clovis Community College with a nursing degree. After chatting on Facebook, the two decided to go on a blind date to Chili’s. They instantly connected and spent nearly 4 hours getting to know each other. Morgan and Makayla dated for a little over 3 years before he popped the question. Makayla’s story of the proposal is just perfect. What is one of your favorite memories from you wedding day? 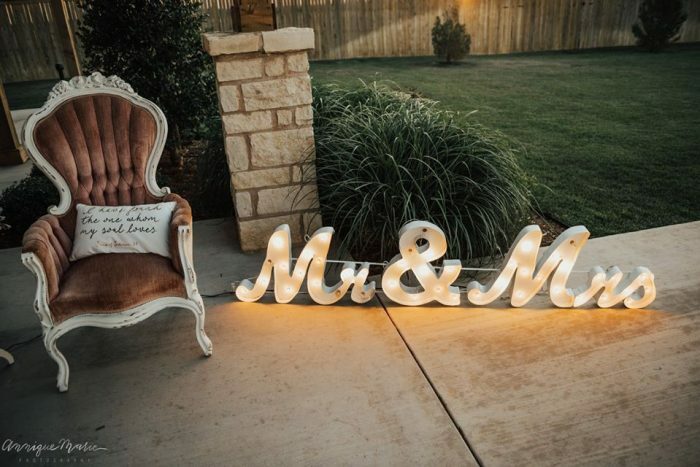 We absolutely adore this couple and wish them a lifetime of happiness together! If you aren’t looking on Pinterest for wedding inspiration you are missing out! I often find myself scrolling through Pinterest thinking “why didn’t I have this when I was getting married!” I had a really hard time narrowing my list down to 5 of my favorites to share with you. One of my best friends recently did this at her wedding and it was so much fun. 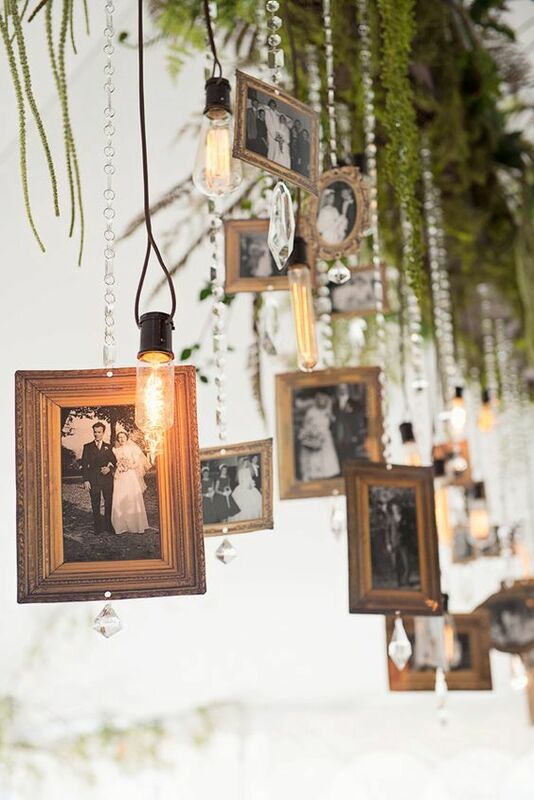 It is such a great way to remember each friend and family member who attended your wedding. Not only does it create a special memory for the Bride and Groom but it is a lot of fun for the wedding guests as well! 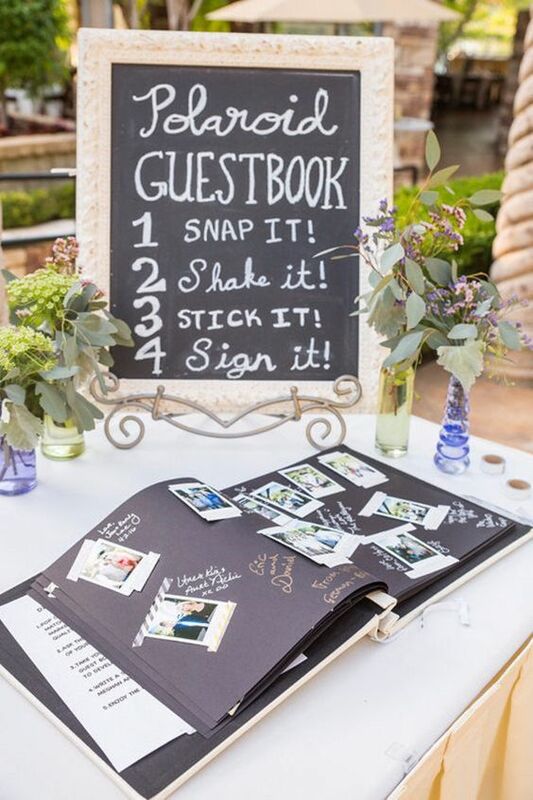 Another unique wedding guest book idea is something framed that you can hang in your home. 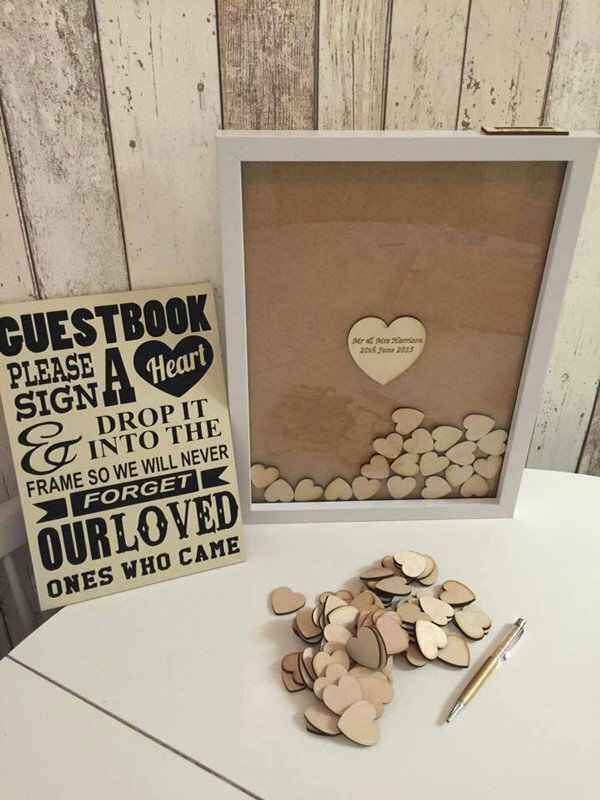 I love the idea of each person signing their name on a heart and dropping it in the frame. This is such a cool idea that you can hang somewhere and be reminded of all your loved ones who attended your wedding day. I’m sure most of your wedding guests are snapping selfies and posting them on Instagram and Facebook throughout your ceremony and reception. 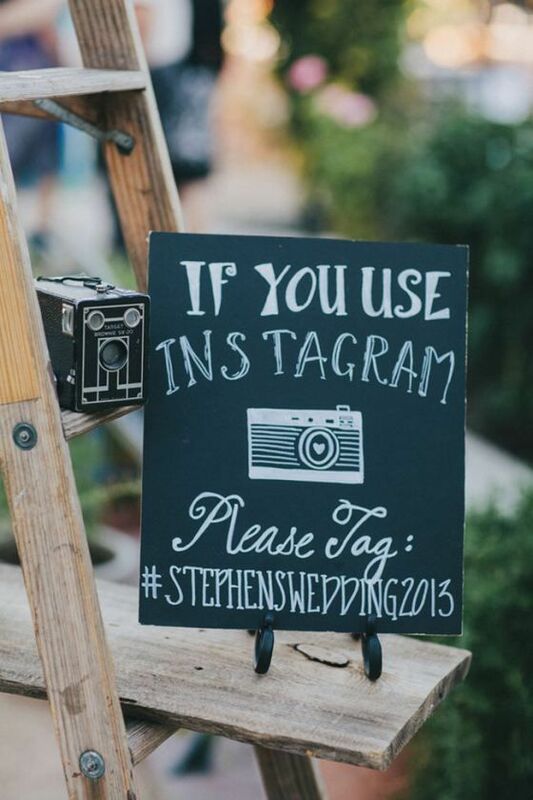 This is a fun way to make sure you get to see all the wedding pictures your guests took of your wedding day. 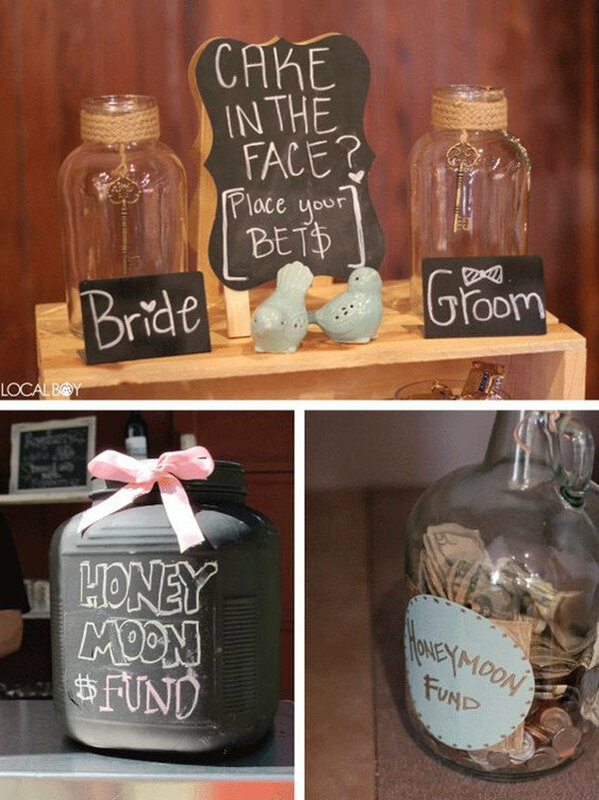 I have attended several weddings lately where a honeymoon fund was part of the reception. A dance with the Bride or Groom is the most popular I have seen but I love the idea of guessing who will get the wedding cake in the face. I saved the best for last. This is by far one of my favorite ideas. This is an idea I wish I would have thought of for my wedding day. Framing pictures of loved ones who have passed or creating a family tree with framed photos is such a sweet, sentimental touch. We’ve had several brides at Autumn Oaks who beautifully displayed pictures of passed loved ones. See a few of them here, on our Autumn Oaks Event Center Facebook page. 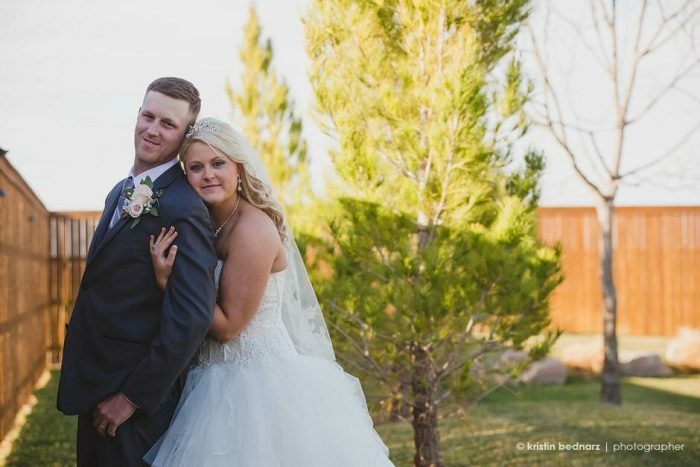 Bailey and Ben tied the knot at Autumn Oaks Event Center in August. They had a gorgeous outdoor wedding on a beautiful, summer day where they were surrounded by family and friends. The couple ended the night with an indoor reception in the banquet hall celebrating with guests and dancing the night away. These two are the sweetest couple! Can’t you just feel the love from the pictures?! We were so excited for them when they came for their wedding venue tour. Get ready to fall in love with these two and their sweet story. 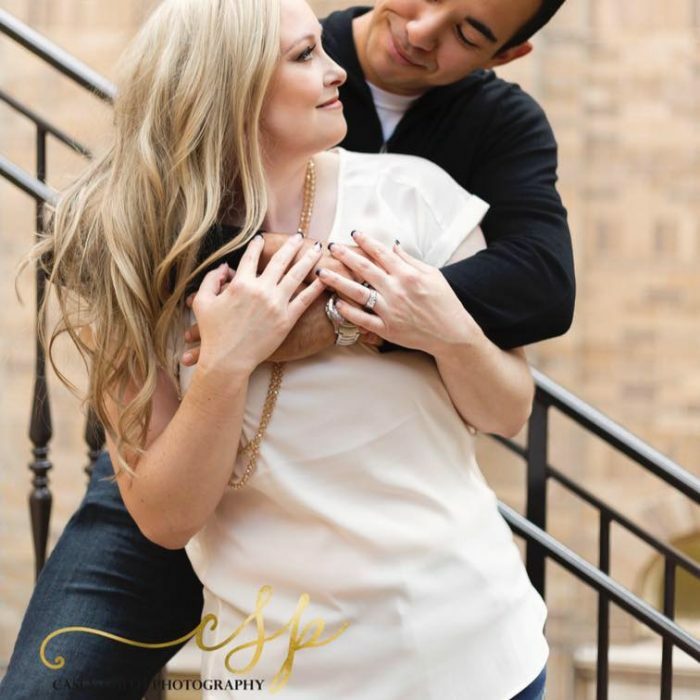 Bailey is originally from Arizona but moved to Lubbock, Texas where she later met Ben her Junior Year in High school. That’s right- High school sweet hearts. Bailey went on to college at South Plains in Levelland, Texas and Ben chose to attend Columbia Southern University. These two weren’t about to let long distance get in their way. They dated for 8 years before Ben popped the question. One of the couple’s favorite things to do together is hike. While on a camping trip with Ben’s best friend, a hike led to Ben getting down on one knee and proposing. Bailey had no idea Ben was planning a proposal and was completely surprised. She was thrilled that Ben’s friend was there to capture the moment for them. 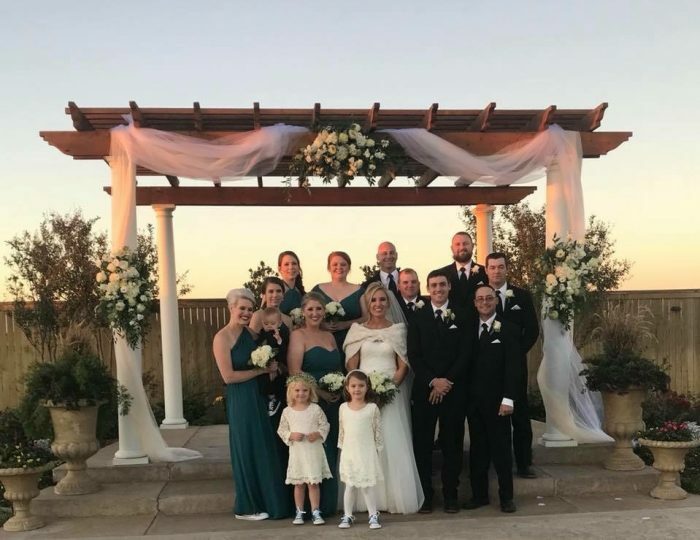 Bailey says their favorite memory from their wedding at Autumn Oaks was “having all our family together in one place.” Isn’t she the sweetest! Autumn Oaks Event Center was honored to host Bailey and Ben’s wedding and had so much fun with this sweet couple. The Bride was gorgeous, the ceremony was intimate, and the cake was delicious! We wish them a lifetime of love and happiness. Share your excitement with your family. They will be thrilled to hear your news and want to know all the details! Make sure to send them a picture of the engagement ring! After sharing the news with your family be sure to tell your closest friends. Let them know that you want to be the first to post your “We are getting married” announcement on social media. Make an appointment at the spa and salon. Everyone you see will want to see your ring so you will want your nails to look great too! Don’t forget the engagement pictures you will want to take! Ask friends and look online at portfolios to find your photographer. Decide what style of photography you like best and choose a photographer with the same style. Keep in mind this can be a wedding photographer interview for the big day! Decide with your fiancé on a wedding date range that would work for you both. Keep in mind setting a specific date could be challenging when picking your wedding venue so setting a range of dates may make things easier. Before you can really start planning your big day it’s important to set your budget. Forget the traditions of what the Bride’s family pays and what the Groom’s family pays. Sit down with each family and see what they are willing to help with. Once your budget is established you can move on to making choices like how many people you will invite. Creating your guest list is something else you should do while you are sitting down with each family- the moms won’t let you forget anyone! Once you have an estimate on how many people you will invite you can start looking for a wedding and reception venue that will accommodate all your guests. Now that you have narrowed down your guest list you can decide on the location and venue or event center for your wedding. 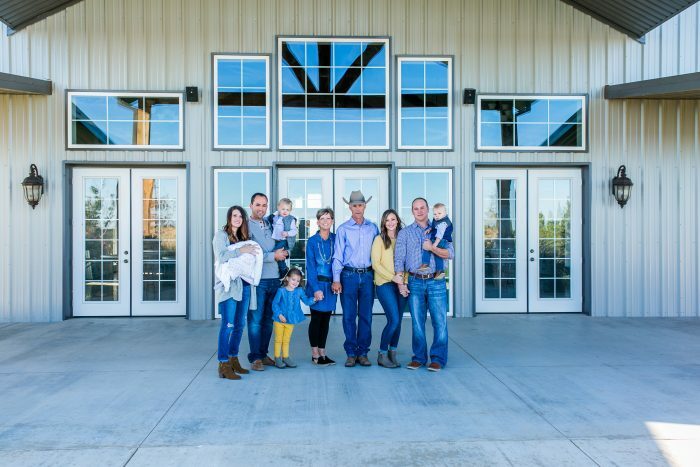 Make sure to schedule a tour so you can visit the venue and see what all they offer. There are so many fun ways to ask your closest friends to be bridesmaids and groomsmen and share your special day with you. My sister in law sent me a box full of goodies and a card that I still have. Check out Pinterest for inspiration! Now for the fun stuff!! You have most of the big choices out of the way it’s time to find THE dress. If you haven’t already, get online and find several different styles you think you are interested in. Then, invite your girls or just go with your Mom and try on as many as you want until you find the one. Take pictures, laugh, and soak in all the memories!